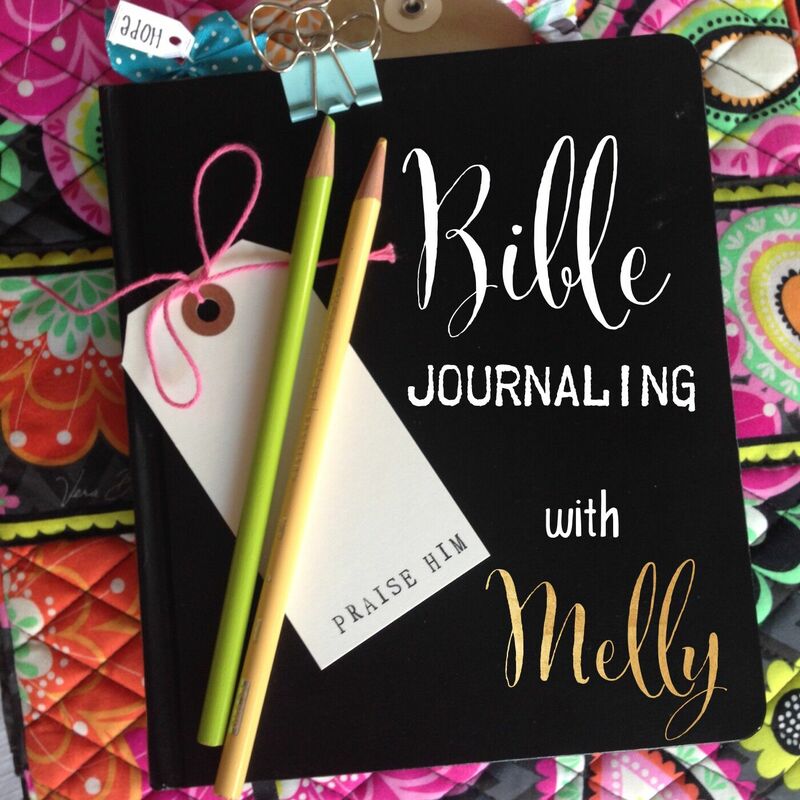 I thought I would share this cool project with you that I've been working on for the last week. A really neat lady is retiring this month who has worked at United Way for 40 years. 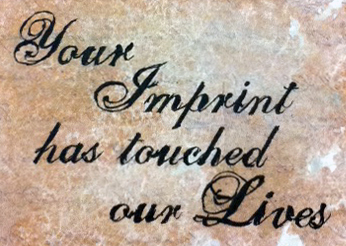 We wanted to give her something she could display in her home to remind her of the lives she has touched over the years. One of my coworkers suggested something akin to a guest book tree (you know the ones with the blank branches that people put their fingerprints on to look like leaves). 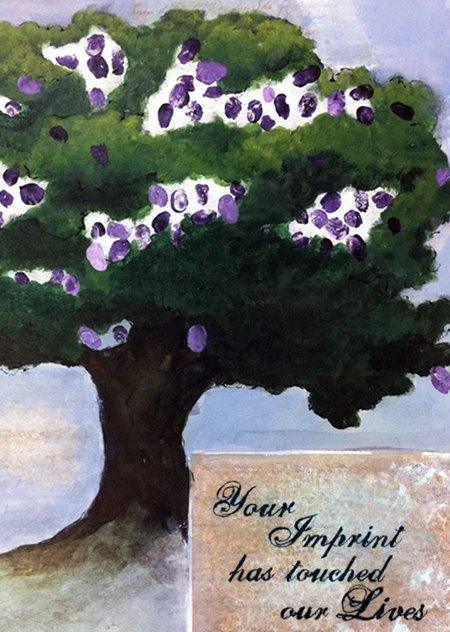 I feel like the guest book tree is over-done, so I adapted the idea into an actual piece of artwork. 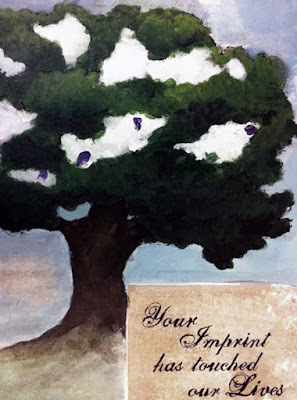 We were going to be "collecting" thumbprints at Jan's retirement party and I was concerned that without a formal headcount, I wouldn't know how big to make the tree and may end up with too many branches and not enough thumbprints to make it look full and pretty. Painting an entire tree, leaves and all seemed like the best solution. That way, it didn't matter how many people showed up. 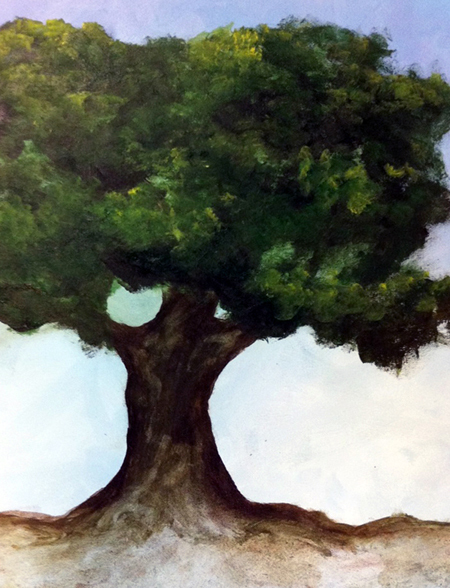 First, I painted a tree on a 24"x30" canvas in acrylics. You'll see that during the entire process, I continued to mess with the tree and the background, so it looks a lot different from the beginning to the end. We wanted to add a sentiment to the painting, so I decoupaged a piece of tissue paper on the canvas and used washes of brown and pink paint to blend it in to the painting and add texture. 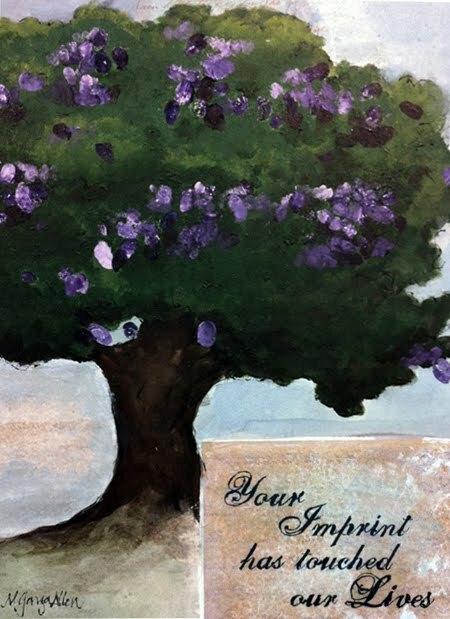 If I ever do another memory tree, as I've named it, I will probably just paint the words across the bottom under the tree. But, this is how everyone liked it. 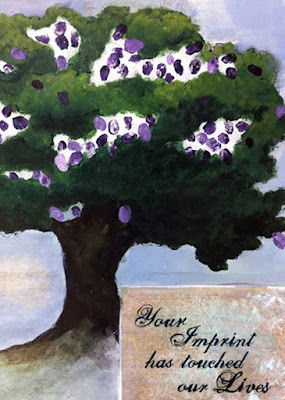 I added some white areas on the tree because we were going to use purple, Jan's favorite color, for the thumbprints and I wanted to make sure they would stand out against the green. So the white paint served as a primer to make the thumbprints pop. Once everyone had added their imprint on the painting, I went back and painted over the white areas, messing with the tree some more, and it was complete! I'm very pleased with how it turned out and Jan loved it. I call that a success!